Some of the most fascinating and regionally distinctive aspects of folklife are connected with what people do for a living or the recreational activities in which they engage. While some of these aspects also can readily fit into the more familiar folklife categories, such as oral traditions, material culture, or traditional performing arts, some are harder to pigeonhole. A few examples are dowsing or "water witching," knowledge of weather changes shared by commercial fishermen, hand signals used to communicate in noisy factories, special techniques of wrapping electrical cords used by sound engineers, and blacksmiths' knowledge of how different metals react to heat. Because work and recreational groups are folk groups, all have at least a few traditions shared among their members. These might be slang terms, jargon or other specialized language, "inside" jokes, modifications of equipment, or many other kinds of specialized knowledge picked up by observation and experience. In this activity, students will have the opportunity to research examples of occupational and recreational folklife that exist in their communities and in other parts of Nebraska. Research one or more examples of both occupational and recreational folklife found in Nebraska. Complete a photo or video essay (or alternative artwork) on one type of occupational or recreational folklore. Discuss how Nebraska's natural and/or cultural environments influence its occupational and recreational folklore. The following are common types of occupational and recreational folklife occurring in Nebraska. Obviously, some examples also fit under other categories of folklife, as well. Folklife covers a lot of territory, and examples can be classified a number of different ways. 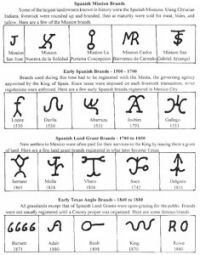 Cattle Brands - Much like heraldry in Europe, cattle brands are handed down in families for generations and often are used on signs, gates, and even home furnishings. Some are combinations of family initials, and some form words, such as the "lazy J" which is the letter J on its side. To see some Nebraska brands go to the Nebraska Brand Committee website. Dowsing or Water Witching - Despite its common name, this divining (fortunetelling) technique has absolutely nothing to do with witches or the occult. Instead, it is said by believers to be an electrical, magnetic, or some other type of sensitivity that some individuals naturally have and others don't. Although scientific tests haven't validated dowsing, people have used it widely for centuries to find water and locate wells in the dry Great Plains and elsewhere in the world. There are many reports of success. In addition to locating water sources, dowsers have been known to locate gas mains, other underground conduits, and even graves (see handout on dowsing for an example of grave finding.) Some municipal water companies also have used dowsing to pinpoint the locations of old water mains. University of Nebraska County Extension offices, well drilling companies, newspaper offices, and local historical societies would be good places to start to locate information on local dowsers in Nebraska. Home Health Remedies - People in some cultures have used traditional remedies for human and domestic animal diseases for many centuries. For example, the bark and leaves of the willow tree were known to be and used as a pain remedy as long ago as the 5th century B.C. in Greece. However, scientists didn't isolate the active ingredient from willow bark (aspirin) until the late 1800s. Since that discovery, researchers have found a scientific basis for many other traditional cures. Leatherwork and Related Crafts - Examples are saddle, tack and boot making and repair; leather and rope braiding; and horsehair hitching. Most ranchers and cowboys create some of their own gear. 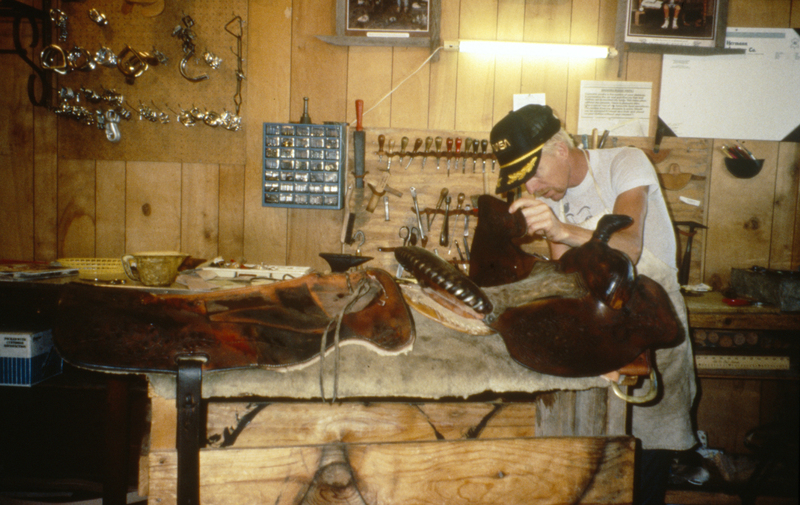 Some pursue these crafts on a part-time basis, and a few become full-time saddle and tack makers and/or repair persons. Speaking of repair, few things go to waste in Nebraska ranch country. When boots are too far gone to repair, they often wind up on a "boot fence." Planting and Animal-Raising Lore - Copies of the Farmer's Almanac usually have some of this information. Other sources can be found in libraries or on the Internet. Weatherlore - Both farming and ranching are intimately tied to the weather, and Nebraska's conditions are notoriously changeable. Therefore, there are always plenty of stories, jokes, and other lore about the weather. For some good Midwestern examples, see the Wisconsin Weather Stories Internet site. Welding and Other Metalwork - Farmers and ranchers use a lot of machinery in their work and must know how to take care of it and repair it when necessary. Some of them also use their skills in welding and metal fabricating to make more decorative items, such as mailbox holders, signs, gates, and yard sculptures of various kinds. Hunting, Fishing, and Trapping Folklife - Examples of this type of folklife are carving homemade decoys, making lures, doing taxidermy, collecting lore about good fishing holes, or telling stories about hunting or "the fish that got away,"
Occupational Jokes - Specialized jokes that are shared only between members of a group are common among police, firefighters, medical personnel, students, teachers and professors, railroaders, government workers, letter carriers, military personnel and other occupations. Sports Traditions - Baseball (both professional and non-professional) is an American sport well-known for its lore and traditions. These include lucky objects and rituals, superstitions, and legends about famous players and teams. Football is another case in point. One of many traditions associated with the University of Nebraska's Cornhusker football team, for example, is the horseshoe hanging above a doorway in the "tunnel" from the locker rooms to the field. Players all jump up and touch it for luck on their way out into the stadium. The activities of sports fans from wearing team colors on game days, to making home-made signs, to displaying team mascots on buildings and vehicles are also part of folklife. Work Songs - These are rhythmic songs intended to be sung to help people doing manual labor to keep up their pace and work smoothly together. Three well-documented types from the past are sailors' shanties, railroad gandy dancer's songs, and fieldworkers' hollers. Xeroxlore and Cyberlore - Xeroxlore is a form of folklore especially prevalent in offices and educational institutions in which anecdotes, lists, jokes, cartoons, sayings, and "urban legends" are propagated via photocopied documents. A similar type of folklore, cyberlore, circulates on the Internet in the forms of Internet hoaxes, altered photographs, and "urban legends" spread via email. Folklorists study these newer, emerging forms of folklife, as well as the more traditional kinds. Students are apt to know many examples of these types from their own experience. Begin the activity by holding up the image of a saddlemaker at work on a saddle, a homemade sign supporting a sports team, and a forked stick such as those used for dowsing. Ask the class to make some guesses about what these three things might have in common. After students make a few guesses, explain that the three examples are all examples of folklife associated with people's work or recreational activities. Share examples of the other types of occupational and recreational folklife listed above (use those included in this web site or from your own or friends' experiences). Be sure to include examples from several different occupational or cultural groups. Ask for other examples from the class. Give students directions and suggestions for researching types of occupational and recreational folklife (or substitute one of the "Sample Alternative Projects for Students" included below). Why are there more saddle and tack makers in central and western Nebraska than in eastern Nebraska? Does the amount of yearly rainfall affect the occupational or recreational folklife I researched? Why or why not? What types of occupational or recreational folklife would be the least likely to be found in Nebraska? Why? Is the occupational or recreational folklife I researched likely to continue in Nebraska over the next 50 years? Why or Why not? What kinds of occupational and folklife do newer immigrants to Nebraska have? 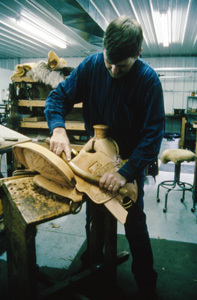 Visit a saddle shop, farm, or ranch and interview an owner about the traditions that are part of their work. Students can document the experience through notes, photos, video, or audio recordings. A collective booklet, photo collage or video essay are possible products. Invite a rancher or farmer who writes western poetry to class to share his or her work, or listen to video or audio recordings of cowboy poetry. Using rhyme and meter, write several poems about a favorite Nebraska place or favorite hobby. Compile these in a booklet, if desired. Learn a traditional fishing or hunting skill from a relative, friend or community member. Examples are fly tying, casting with a rod and reel, tanning leather, tracking, making a duck call, or making a homemade decoy. The experience should be documented with photos. In this portion of the lesson, students researched examples of folklife that are tied to occupations and important recreational pastimes. They had the opportunity to create artistic works that documented one or more of these examples of specialized folklife. They also considered environment as a major factor in the types and quantities of occupational folklife in our state. In the final activity of this lesson, students will experience traditional music and dance froma number of Nebraska cultures. Complete a photo or video essay (or alternative artwork) about one type of occupational or recreational folklore. (8.7.2) By the end of the eight grade students will develop an understanding of relationships among populations, resources, and environments. A song written and performed by Howard Parker. A song learned from his grandfather, performed by Howard Parker.